VIP “chefs” with kid judges at the Virtua Throwdown for Kids. VIP “chefs” check out the Virtua Mobile Farmers Market bus (from left): Camden City Council President Frank Moran, NJ Dept. of Health Commissioner Cathleen Bennett, Chef Carla Norelli of Vetri Community Partnership, 76ers legend World B. Free, and Virtua Executive Vice President Al Campanella. A panel of Camden kids judged five prominent adults in a high-spirited cooking “throwdown” recently in Camden. One of those “chefs” — former 76ers star World B. Free — won the whimsical “Golden Spatula” award for making the judges’ favorite recipe: Watermelon and Tomato Salad. 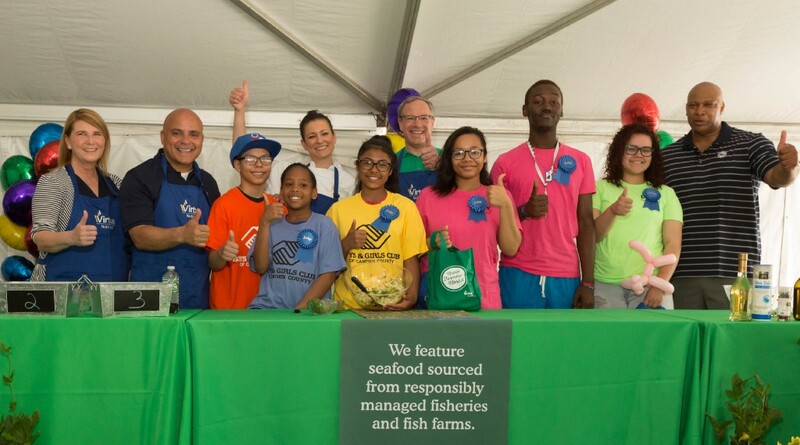 The Virtua Throwdown for Kids served a deeper purpose: It launched a major public health program — the Virtua Mobile Farmers Market — which will benefit 6,000 South Jersey families in its first year. The goal is to reduce hunger and increase consumption of fruits and vegetables in key communities where access to fresh produce is limited, and thereby improve residents’ health. The Mobile Market will sell the produce at below-wholesale prices. 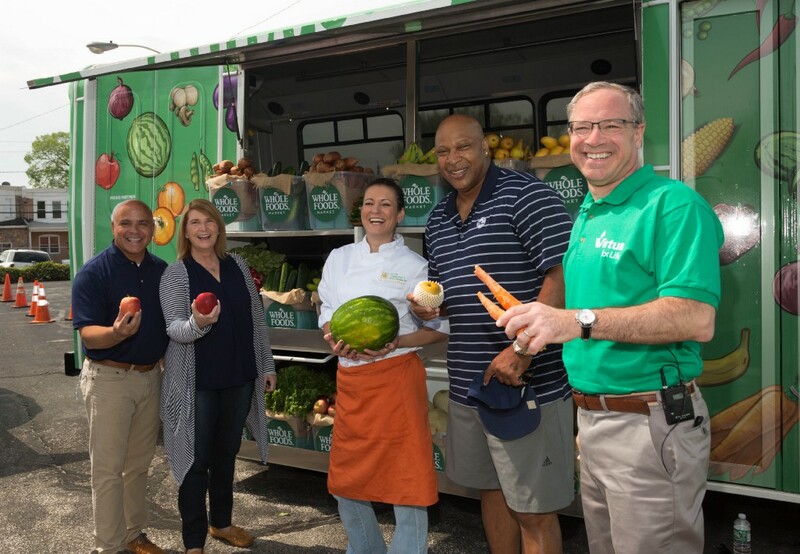 With this initiative, Virtua is the only health system in the Delaware Valley and N.J. to operate a mobile farmers market. Lead partner Whole Foods Market is the program’s exclusive produce vendor, and Vetri Community Partnership was a partner in the Throwdown event. During the event, each “chef” made a healthy recipe using produce as main ingredients. The young judges — ages 7–15 — tasted each dish, chose their favorite, and awarded the “Golden Spatula” trophy to the winner. The community received free samples of each recipe and checked out the new Mobile Farmers Market — a 23-foot bus brimming with fresh produce. The event also featured kid-friendly entertainers, face-painting, balloon sculpting and more. Each family received a free bag of produce, recipes and other giveaways. Attendees included representatives from Whole Foods Market, the U.S. Department of Agriculture, and the New Jersey Healthcare Quality Institute. Starting Monday, May 1, the Virtua Mobile Farmers Market began visiting six towns in Burlington and Camden counties every week, year-round. More towns will be added soon. A healthy diet — including five or more servings of produce daily — can help prevent or reduce serious health issues including heart disease, diabetes, stroke and many types of cancer. However, many South Jersey residents lack access to healthy food. “About 14% of Camden County residents and 11% of Burlington County residents don’t know where their next meal will come from,” explains Suzanne Ghee, Virtua Assistant Vice President of Business Growth and Community Health Engagement. The figure is even higher in impoverished areas like Camden City, she notes. People who are “food insecure” often eat cheap, low-nutrient fast food and junk food. Many live in “food deserts” where little fresh produce is available. A Virtua dietitian will travel on the Mobile Market bus, offering shoppers advice on nutrition, food preparation and healthy living. Shoppers will choose their own produce to fill a small, medium or large canvas bag provided by the program. Prices will range from $2 for a small bag — designed for one or two people — to $14 for a large bag, sized for a family of six. Prices are one-third or less of the food’s retail value. Lead partner Whole Foods Market will provide the produce, which will include seasonal produce from local farms in New Jersey and Pennsylvania, ensuring super-fresh, high-quality food. The program will accept Supplemental Nutrition Assistance Program (SNAP) benefits, and SNAP beneficiaries will receive further discounts. http://FB.me/virtuamobilefarmersmarket or the program’s webpage at www.virtua.org/MobileMarket. The Mobile Farmers Market program is funded primarily by the Virtua Foundation, the fundraising arm of the nonprofit Virtua health system. The Virtua Foundation works closely with generous donors to raise vital funds that support Virtua’s patient care, health education, technology and community outreach. In addition to Whole Foods Market, other generous partners include City Green’s Garden State Good Food Network, Coopers Ferry Partnership, The Food Trust, and the U.S. Department of Agriculture. Virtua will conduct a study to measure the results of the program, such as improved health and behavior changes (such as greater intake of fresh produce and reduced intake of unhealthy foods). Residents will be asked to complete a quick, seven-question survey each time they visit the Mobile Farmers Market. Results will be analyzed over time to measure the program’s benefits.